« Reductio ad Hitlerum, Part 26: What if Hitler had a deathbed conversion? I preached a sermon yesterday called “Do Not Be Anxious” on Matthew 6:25-34. Since I no longer preach from a manuscript, I’ll transcribe and post the sermon later this week, God willing. As I was preparing this sermon, I read the following words from Frederick Dale Bruner on the relationship between faith and works implicit within Jesus’ Sermon on the Mount. Bruner is a kindred spirit; whenever I get to preach Matthew (or John), I reach first for his very helpful “theological commentary” on this gospel. Bruner’s insights help alleviate the nagging fear of a convinced Protestant like myself that I might be in danger of—say it isn’t so!—overemphasizing the doctrine of Sola Fide—that we are justified entirely by faith in Christ, and our good works play no role in saving us beyond confirming the authenticity of our faith. The Jesus revealed in Matthew’s gospel, especially in the Sermon on the Mount, emphasizes doing. So are we sure that we’re justified by faith alone? For the Christian who comes to the Sermon on the Mount from the literature of Paul (as I, in my Christian history, do) there is a difficulty with this emphasis on doing. Paul’s theology of grace has shaken the foundations of all confidence in deeds (or “doings”), even in the best of deeds, namely, the deeds done in obedience to God’s teaching, called “the works of the law” (erga nomou). Paul contrasts trust in our “doing” with trust in Jesus Christ and his doing, for example, in the great third chapter of Galatians (Gal 3:2 and 5 especially). Paul’s gospel of salvation by Christ’s faith-eliciting work alone, received apart from even our best human doing, has more than once reformed and blessed the church and seems to be what the Christian gospel at its core is all about. What then are we to do with the Sermon on the Mount that asks us above all to do the good works of the commands of Jesus if we wish to be safe? Bruner reminds his readers of what he’s said about the Inaugural Beatitudes, with their emphasis on spiritual poverty before God (“blessed are the poor in spirit,” “those who mourn,” “the meek,” “those who hunger and thirst for righteousness”). Jesus begins his sermon, in other words, addressing people who recognize their need for God’s mercy, grace, and forgiveness before anything else. We must remember, Bruner says, that these Beatitudes, “which can best be interpreted as Jesus’ gifts of grace,” precede the Commands and enable them. Then the Commands themselves are so hard, so high, so total that they cannot be kept without a swift flight back to the Lord of the Beatitudes for mercy and help. No one who has tried to keep Jesus’ demands can, I think, deny this flight. Then the Commands are followed and backed up by the sixth chapter’s long call to faith. (Faith is especially the point of the Lord’s Prayer at the heart of Matt. 6). This is all to say that the Commands to do in the Sermon on the Mount are preceded (in the Beatitudes) and followed (in the Lord’s Prayer) by gifts (especially the gifts of forgiveness: “forgive us our failures”; the following “as” does not cancel, it confirms). The fifth chapter’s Beatitudes and You Ares and the sixth chapter’s faith and prayer are all gifts to the seeking, yes, the trying people of God. I do not see how a single line of the sermon can be read without feeling summoned to one’s knees before God—that is, to what Paul calls faith. And yet the summons to our knees is never an end in itself; the calisthenic of this sermon is to move repeatedly from kneeling to walking. The direction of the Sermon on the Mount is to the deed—but it is equally from the gift. It is toward the neighbor through the Father. Where Paul carefully separates faith from deeds in order to give all glory to God’s mercy, Matthew’s Jesus commands such high-quality deeds that we are driven to faith in God’s mercy. The dynamics are different but complementary. The height of the deeds to which Jesus calls in this sermon can only be approached by people walking on their knees. I can heartily say “Amen” to this, but not before saying more about how the Commands are “so hard, so high, so total that they cannot be kept without a swift flight back to the Lord of the Beatitudes for mercy and help.” This is, perhaps, an understatement. This is the power of the Sermon on the Mount: Christ pitches it high. People think because I talk about grace that I’m lowering the demand of the Law – quite to the contrary. I’m increasing the bar; I’m lifting the bar of the demand so you can earlier begin to say, “I cannot do it” …I’m telling you that the demand actually is higher than you know, and that allows you to go on your knees more quickly. The moment that I recognize that I, by my own efforts to atone, or to expiate, or to do better, or to fly right, or to do more, or to work harder, or to be nicer, are doomed to perdition – at that moment there is a release. And the release spells joy, power, significance, exuberance, happiness, creativity, love, and – come to find out – holiness. 1. 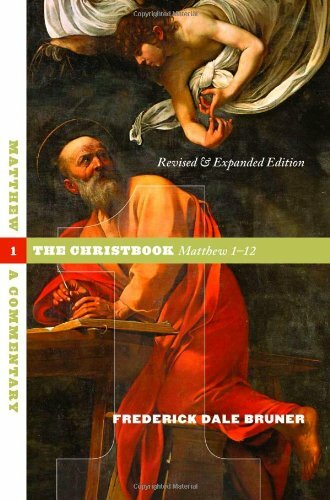 Frederick Dale Bruner, The Christbook, Matthew 1-12 rev. ed. (Grand Rapids: Eerdmans, 2004), 368. This entry was posted on	November 26, 2018 at 4:41 pm	and is filed under Uncategorized. This is very thought provoking. I am reminded, though, of statements like, “Be ye doers of the word, and not hearers only, deceiving your own selves.” It is certainly true, though, that a thoroughgoing assessment of the Sermon on the Mount demonstrates that we cannot fully comply with it. “Be ye therefore perfect, even as your Father in Heaven is perfect.” So, is there a way to reconcile an “I cannot do it” with a “be doers”? (Recall that John the Baptist rebukes the Pharisees who come to him for baptism with, “Bring forth, therefore, fruits meet for repentance.”) In my opinion, merely,I think that there must be some “effort” involved, and not “merely” as “evidence” of a salvation “otherwise obtained.” See: “If a man love his father, mother, etc. more than me, he cannot be my disciple.” And many other such passages by Jesus. My take is, we have to “turn over our lives” to God. Of course this does not connote “perfect obedience,” but I think it is similar to accepting Lincoln’s amnesty at the conclusion of the Civil War. You can be forgiven, but you have to “lay down your arms.” You have to, in other words, “switch loyalties.” That is what I think is meant by “repentance,” which Jesus and John the Baptist and Peter all said is necessary to salvation. And Paul says in Acts that he preached to all men everywhere that they must repent. “Faith without works is dead,” as James says. So there has to be a “turning around.” And the grace is that this is sufficient due to Christ’s sacrifice,because “perfection” is not obtainable (John in John 1), which perfection is what the “law” required. As I say, my take.